The other morning, bright and early, we - Adam, Kaden, River, me, and a family friend - headed up to Tampa for another visit to Busch Gardens. Before leaving the house I checked the weather report - partly sunny and 75. Not "hot" to us (please don't throw things at me), but warm enough that we all thought we'd be fine in shorts and tees. By the time we got to Tampa it was drizzly and about 63 but still the forecast said 70's, so we pressed forward. As soon as we got out of the car I started digging for a sweater or jacket; it was chilly! As soon as we got into the park I bought River a sweatshirt (for just $12.50 - very reasonable for a very nice comfy, warm sweatshirt). By the end of the day I'd bought Adam and Kaden sweatshirts as well. It never got over 65 and it rained until after 3 pm. We had so much fun! Let me tell you, if you ever have the chance to go to Busch Gardens Tampa on a cool, drizzly day go for it. Really, go. There were no lines for anything. The park wasn't empty, by any means, but was so perfect crowd-wise (probably not great for Busch Gardens, but great for us!). No long waits, no peering around people to see things - the park was just so relaxed and comfortable. I'm not sure if it was the weather or if it was because it was a Monday, but it was a perfect day for Busch Gardens. Other than planning ahead and dressing more warmly our day couldn't have been any better. I opted to visit Busch Gardens in December so we could see all the Christmas decorations and lights. Busch Gardens celebrates the holidays with Christmas Town, evenings of lights and activities throughout December. We happened to visit on a day that the park closed at 6 pm and Christmas Town wasn't open, I'd like very much to go back and enjoy the events and lights sometime as the employees we talked to said it was wonderful and well worth seeing. Even without Christmas Town the decorations were stunning. It was a perfect way to get into the holiday spirit. On our last visit to Busch Gardens we made a counter-clockwise circle from the entrance but ran out of time and were hampered by rain before seeing and doing everything we wanted to so for this visit we traveled clockwise. Our first stop was the Bird Gardens and Walkabout Way, a wonderful kangaroo habitat. The kangaroos were like adorable, loving puppies, begging for chin scratches. We listened to one of the animal caretakers tell about the kangaroos and also watched him give a few of them bottles of apple juice. After leaving that area we heard music, followed it, and found a show going on at Sesame Street Safari of Fun. River enjoyed the Sesame Street Christmas Show, Elmo's Christmas Wish, and all three boys liked the climbing treehouse and play elements. Had there not been roller coasters beckoning I think we may have stayed there all day. The roller coaster riders among us, Kaden and a family friend, couldn't wait any longer so we moved forth to Stanleyville and Sheikra, the Stanley Falls Flume, and the Tidal Wave. River and I rode the log flume, which was the highlight of the day for me. He's a funny kid and he made it clear he wasn't overjoyed that there were two drops, one of which was kind of big, that no one had warned him about, as much as I wasn't too sure about the big drop either I was way too busy laughing to worry (and he's agreed to go on it again next time). Next we visited the tigers in Jungala, as well as the Treetop Trails. When River was a baby he and I would spend hours in the tot water play area while the big kids played in Treetop Trails, this time he was off with the big kids. I couldn't help but reminisce about all the fun we've had at Busch Gardens over the years. Adam always requests the Bumper Cars. Always. We spent a long time there, as always. The roller coaster riders ran off to ride Kumba a few times (again, no lines) while Adam and River practiced their crashing skills. I can say, without a doubt, that the roads will never be safe with them on them. Lunch was next, in the Pantopia Grill. We managed to time lunch perfectly and caught the Christmas Celebration show, with singing, dancing, Santa, and gigantic inflatables. Lunch itself was really good, the kids had kids turkey sandwiches which came with fries and applesauce, and I had no problem substituting steamed veggies for fries for the non-fry eater. The kids meals were about $6 each and included a drink. Falcon's Fury followed. Kaden decided to pass on this one, even though he'd been talking about it for months and the ride is new since our last visit. Our friend went on it alone and lived, which was all the proof Kaden needed ... he rode it and loved it. Falcon's Fury is the tallest free-falling drop in the United States and, apparently, it's a lot of fun because the guys went on it again. And lived to tell about it, again. I'm pretty sure they'd have done it a few more times if we hadn't been moving on. Off to see the animals! My favorite part of Busch Gardens. The animals were followed by a relaxing train ride around the park, traveling through the Serengeti Plain. The round trip train ride lasts about 35 minutes and is a great time to get a little rest and "reboot" for the rest of the day. Our "conductor" was a lot of fun and his commentary made the ride even better. As you can see from the image above, the boys were ready for a little down time; they were then ready to go again at full speed as soon as we got off the train. After completing our train adventure the roller coaster riders rode a few more and then we took in the Christmas on Ice show, which was beautiful. There were some amazing skaters in the show, including a young girl, and the show was really well done, with pretty costumes and lighting. Our last stop for the day was one more show, Christmas from the Heart, a very spiritual, moving show and a perfect way to end our visit at Busch Gardens. One thing we noticed throughout the park and in all the shows was the Christian aspect of Christmas that was presented. There was a nativity scene crafted from living plants and each show contained at least one song about the birth of Christ. We noticed other little touches as well, and we appreciated and respected the park's desire to share a little faith-based Christmas love and to be true to what they believe. The Christmas from the Heart show brought us back to the beginning of the park. We were able to do everything we wanted to do throughout the entire park and we were able to ride every ride at least twice and we saw four shows. I don't think we could have possibly asked for any more than that! The kids had a great day and are are asking if we can go back NOW. The only negative, from any of us and it was from me, was that Christmas Town wasn't open and we didn't get to see the Christmas lights. I've heard such wonderful things about it and it sounds perfectly magical. Of course, we have until the end of this year to go back for that and we just might have to! Right now the Busch Gardens 2015 Fun Card is available and is good today through December, 2015, giving you the rest of this month for free (and a chance to visit Christmas Town). 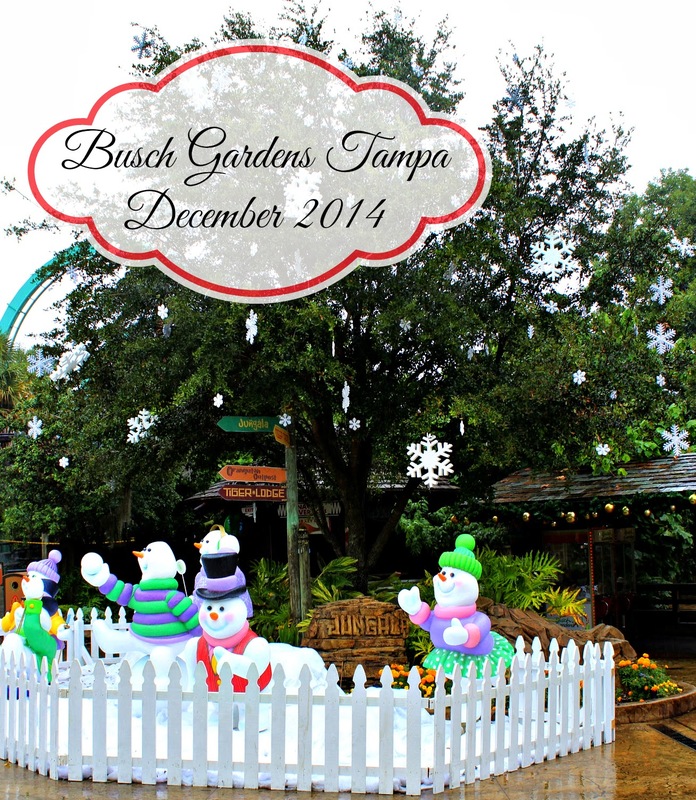 Have you been to Busch Gardens Tampa lately? Have you ridden Falcon's Fury? Have you visited Christmas Town? I'd love to hear about your Busch Gardens visits and experiences.